Charles Wade Barkley (born February 20, 1963, in Leeds, Alabama) is a former American basketball power forward. 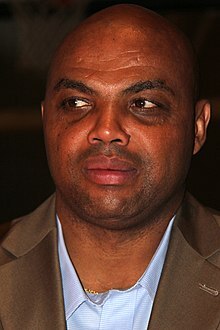 A current resident of Arizona, Barkley is commonly nicknamed Sir Charles and occasionally The Round Mound of Rebound. Barkley was named Most Valuable Player of the NBA in 1993. In 1996, the NBA's 50th anniversary, he was named one of the 50 Greatest Players in NBA History. Barkley won the Olympic gold medal with the U.S. Dream Teams in the 1992 and 1996 Games. He was inducted into the Naismith Memorial Basketball Hall of Fame in 2006. Oklahoma is nothing but vast wasteland. Oklahoma is nothing but vast wasteland; no place for black people. The Oklahoma Sooners and the Hornets are the only brothers in town. Press conference before the USA played Angola in the 1st round of the 1992 Olympics. Barkley's response to Tonya Harding calling herself "the Charles Barkley of figure skating", quoted in They Said It. Sports Illustrated (February 7, 1994). You know it's gone to hell, when the best rapper out there is a white guy and the best golfer is a black guy. Interview in the New York Post in October 2000. Notes: Although Barkley popularised the phrase, it was likely first used several months earlier by Chris Rock. Anytime a fan touches you, you have the right to beat the hell out of him. From CNN interview, Nov 22 2004, following a fight between players and fans at a recent Pistons-Pacers game. I'd have played against him (Len Bias) for the next 14 years. I would have been in my prime and he would have been in his. I'll never forget what he looked like. He was a 'Wow!' player. When Maryland played and was on television, I watched. It was like, 'I need to watch this guy; I'll be seeing him real soon.' . . . It was just shocking. Thing is, cocaine was huge then. My brother had been in and out of rehab a few times. . . . It was a popular drug at the time. And guys I was playing against, like John Lucas and Michael Ray Richardson and John Drew had done cocaine. I was thinking: 'What the hell is up with this cocaine? I should try this once to see what it was all about.' Then, we heard the reports were that Bias only used it once . . . that it was his first time. When I heard that, it scared me to death . . . scared the daylights out of me. It scared me into not trying it even once, not going anywhere near it. Asked to comment on the 20th anniversary of the cocaine-overdose death of Len Bias, "Bias Death Still Ripples Through Athletes' Academic Lives". Washington Post: p. A1. June 19, 2006. Only poor people go to jail. It's great to be hosting SNL again. I hosted sixteen years ago. Back then I was in great shape, I was coming off an MVP season with the Phoenix Suns - now, I play bad golf, drink, sometimes I get arrested. About running for governor of Alabama, on Campbell Brown, CNN, October 27, 2008. Poor people have been voting for Democrats for the last fifty years... and they are still poor.